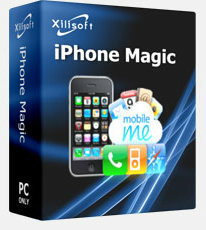 Xilisoft iPhone Magic is the ideal iPhone manager to synchronize your iPhone with your computer. Never again will you have to worry about losing your iPhone files, Xilisoft iPhone Magic can transfer and backup music, videos and pictures on your iPhone to your computer, as well as the iTunes library quickly and efficiently. This all-in-one iPhone manager can also convert and copy files in almost any video and music format to your iPhone, as well as rip DVD movies and transfer them directly to your iPhone. All iPhone (iPhone, iPhone 3G, iPhone 3GS, iPhone 4) and even iPod touch types are supported and you can connect multiple iOS devices simultaneously and transfer files among them. Besides file synchronization, you can also manage your iPhone as a portable hard disk once you have Xilisoft iPhone Magic installed on your computer. Discover the “magics” behind this amazing iPhone manager FREE now! iOS 4.2 is supported. · Support iOS 4.3 2.Support CDMA iPhone 4 3.Add iPhone ringtone management feature 4. · Transfer music, movies, photos, books(PDF and EPUB formats) and iPhone ringtones between iPhone and PC, easy and fast. Backup all files in iPhone to iTunes library, support iTunes 10 well. · Create photo albums from pictures shot by iPhone, import PDF/EPUB books to devices, build playlists for multimedia files freely. · Convert almost all popular audios/videos to iPhone compatible music/movies, including M2TS, MTS, AVI, MPEG, WMV, DAT, TS, MPV, NSV, MOV, QT, H261, H264, WMA, AAC, AIF, AIFF, AC3 and so on. · Rip CD/DVD, including ISO image files and IFO folders as well to iPhone compatible music/movies for playback on iPhone without troubles by DVD encryption. · Transfer PDF and EPUB formats books to iPhone easily; create photo albums, preview and export photos shot by iPhone are also available. · Fully support output files for all iPhone/iPod/iPod touch models. 8.Enable NVIDIA GPU acceleration which improves the performance to a great degree. · Comes with a built-in resizable media player to preview DVD movies, videos and photos and snap screenshots as wish in previewing videos or DVD movies. · Automatically select the optimized profiles when importing multimedia files.